AP postioner on Kinetrol actuator. The AP pneumatic positioner combines smoothness and accuracy with convenience and simplicity of use. It provides unparalleled performance and real industrial robustness, easy calibration, and is well adapted to a whole range of valve and damper applications. 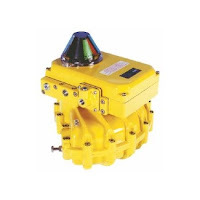 AP options include high flow valves, direct mount or industry standard discrete mount housings, 4-20mA angle retransmit, limit switches, Clear Cone position indicator as well as I/P convertors. Below are 14 features that make the AP positioner a standout among all other valve positioners. Enclosure and Lid – robust die-cast metal with tough corrosion-resistant epoxy coating and O-ring sealing. Layout gives easy access to all adjustments on removal of lid. Spool Valve – highly reliable, all metal, 5 port proportional valve controls the air flow. Three versions, with different flowrates, are easily interchangeable. Carrier Plate Assembly – integrated assemblies carrying the feedback shaft and cam plus angle retransmit drive and pot (when specified). Easily removed for conversion or maintenance. Interchangable Port Plate – easily convertible for different flowrate options. Feedback Pot Drive – zero backlash, proven trouble free for life. Retransmit Pot – high quality conductive plastic servo–type with ball bearings. Proven long life and high precision. Actuator Interface – options include NAMUR standard, Kinetrol male square or Kinetrol direct mount female square. Quick external conversion allows bracket mounting to any rotary or linear actuator. Internal Angle Scale – with adjustable indicator for easy field calibration. Exhaust Snubber Screws – allow travel speed reduction down to 1/ 3 x full speed, independently in each direction, by screwing in to restrict exhaust air flow. Gauge Port – as standard. Span and Zero Adjustment – quick and easy thumbwheel setting with slotted locking screw. Feedback Cam – quick and easy reversal ( for rotational sense handing) or replacement (to change the response characteristic) of the cam is facilitated by a spring loaded retention device. Feedback Shaft – innovative collet connection permits quick – fit/release of the actuator interface and eliminates backlash. Airflow Changeover Block – allows selection of direction in which positioner moves (for direct mount models). Most recent version of Kinetrol catalog including Blueline coating for foodservice applications. Kinetrol rotary vane actuators are used to operate or position ball, butterfly and plug valves, ventilation dampers and automatic doors. Uses also include movement and positioning of components during manufacture - in fact anything that needs to be turned through 90° or less, automatically or by remote control. You can download the Kinetrol Product Catalog from the Kinetrol USA site here.